A discussion between Canadian media theorist Chris Russill, associate professor at Carleton University, and Kate Maddalena, assistant professor at the University of North Carolina Wilmington, articulates Russill's work in terms of current conversations in media-related cultural studies. 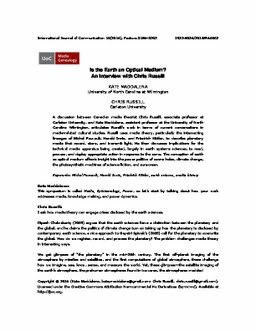 Russill uses media theory, particularly the intersecting lineages of Michel Foucault, Harold Innis, and Friedrich Kittler, to describe planetary media that record, store, and transmit light. He then discusses implications for the technical media apparatus being created, largely in earth systems sciences, to read, process, and deploy appropriate action in response to the same. The conception of earth as optical medium affords insight into the power politics of ozone holes, climate change, the photosynthetic machines of science fiction, and sunscreen. Maddalena, K. (Kate), & Russill, C. (2016). Is the Earth an optical medium? An interview with Chris Russill. International Journal of Communication, 10, 3186–3202.